Risotto with sun-dried tomatoes is a decadent, delicious vegetarian and dairy-free vegan main dish. 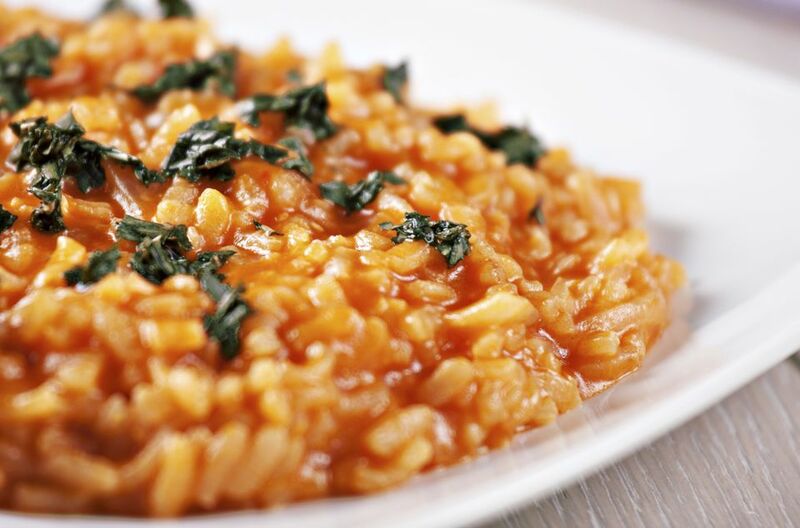 Flavored with fresh basil and parsley, this Italian sun-dried tomato risotto recipe makes a colorful rice entree. Sautee the onion and garlic in olive oil for 3 to 5 minutes or until soft. Add the risotto rice and cook, stirring constantly to avoid burning. Allow to cook for about 2 to 3 minutes, or until rice just starts to brown. Add 1 cup of water or vegetable broth and stir well to combine. Add a dash of salt and pepper. When most of the liquid has been absorbed, add one more cup of water, along with the tomatoes, basil, and parsley. As the moisture gets absorbed, continue to add broth or water one cup at a time, stirring frequently, until the rice is cooked. Sprinkle with vegan Parmesan cheese before serving, if desired.